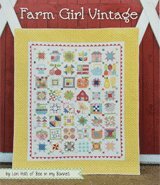 Can I use flannel and other cotton quilt fabrics together on a quilt top? Or should it be all flannel? Of course you can! 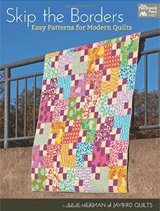 But you'll want to take a couple of things into consideration as you work on your quilt. I find that the looser the weave of the fabric, the more it shrinks when you wash it. Conversely, the tighter the weave, the less shrinkage there is. Because flannel makes such a cuddly quilt, I'm assuming that this is a quilt that you'll need to wash at some point. So my recommendation is to prewash all your fabrics for this quilt. That way you won't have some fabrics shrinking a little and the flannel shrinking a lot. The pre-washing kind of evens out the playing field. 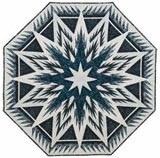 For a real life example, the quilt block below is from a quilt I'm currently working on. 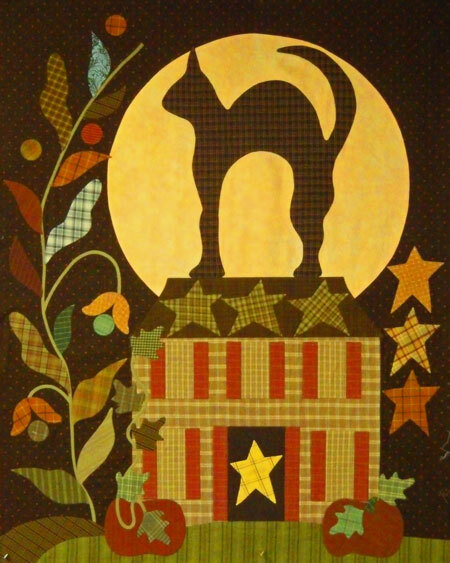 The quilt pattern is "Midnight Silhouette" by Blackbird Designs (if you purchase this pattern from somewhere, please let me know, there's an error in the instructions). In it I've used a combination of flannels, homespuns, quilting cottons and my own hand dyed cotton sateen to get the colors and textures I wanted. All of the pieces in the house are flannels and homespuns. Even though they are invisibly machine appliqued to the top of the block, everything single piece was prewashed to even out the shrinkage. I must wash the quilt to remove the glue used in the applique process, so dealing with it (the shrinkage) is a must. Do check for washing instructions on the bolts of fabric. I was really surprised when doing research for another page. There are a lot of quilt fabrics out there where the recommended washing temperature is 'cool'. Not what THIS quilter would expect?! Cool water...even for flannels?? ?...I had ALWAYS washed them in hot to shrink them. I learn something new every day! Your flannel fabric tends to be thicker than regular quilting cottons. I suggest you do a little 'seam allowance' testing before cutting out all the fabric strips and shapes. If you're always sewing a flannel to a flannel or always a flannel to a quilting cotton...no problem, you just set the seam allowance, test, tweak and go. But if you're switching back and forth, I'd take the time to do just a wee bit of extra testing, especially if there are a lot of seam allowances in the individual block. You needn't spend too much time on this testing. Flannel is a very forgiving fabric to work with and an extra pin here and there to hold things in place should take care of everything. I just started this. I am making memory afghans from my mother-in-law's clothing. I had my sister-in-law wash and dry all the material, even dry clean only. This way everything is preshrunk and there should be little or no issue when the recipients receive them and occassionally need to wash them. 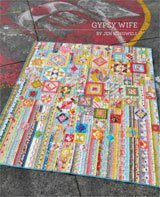 It makes fantastic quilts! So much texture. 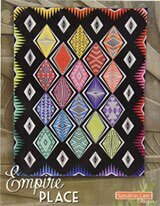 I freemotion quilted each individual block with however the material "spoke" to me. Never knew what that meant when people say that about inanimate objects until I started these quilts. I am a self taught freemotion quilter and I do not long arm. I have a Pfaff Creative Vision 5.5, Creative Sensation, and Creative Sensation Pro. I have finished 2 and am working on the third. Just selected the material pieces I wish to use. If I could attach a photo of the 2 I finished, I would. I have polyester slack material, lightweight flannel nightwear, thin material, cottons, satinny, satin scarves, sweatshirt material, etc. I cut out all the seams. Removed lace and buttons and saved them all to use on the quilts. I fussy cut around pockets and might have enough pockets to put into the center of each afghan. I fussy cut around swearshirt pictures and beads. When I quilted, some parts of some squares I quilted around, ie a Santa on material from a holiday item. So, use whatever you have. I have begun to think outside of the box now and am thinking to always use old clothing bought at garage sales, etc instead of shelling out large sums of money. The fabric is fabulous. Julie replies... Your note makes me so happy. Thank you for sharing. I love that you're using things that have meaning. When we make our quilts we put so much of ourselves into the creation. It's even more meaningful when the memories are layered as you're doing. Fabulous decision choosing to wash everything first regardless of how it was labeled. That way you know how the fibers will behave and the one who receives the quilts needn't worry about washing. You are awesome! Isn't fun when creativity takes over and just pulls you along for the ride. It's invigorating...and addicting—in a very good way. I have been looking for this pattern forever too! Did you hear from anyone on where it can be purchased? It's a bunch of quilters who are selling their surplus stuff. Someone may have the pattern and be willing to get rid of it. I would like to find the pattern Midnight Silhouette. Can you please give me a hint where to find it? It is sold out at the Blackbird designs shop. From the Editor: Carien, I haven't seen it anywhere for awhile, but I'll keep my eyes peeled. Readers, if you know of a shop that still has it, I'd be grateful if you post that information here!